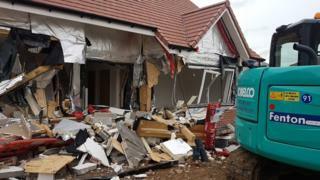 A builder has denied ripping apart five new-build homes with a digger causing £4m of damage. Daniel Neagu, 30, of Athelstone Road in Harrow, north-west London pleaded not guilty at St Albans Crown Court of causing criminal damage. He is accused of damaging homes at the McCarthy & Stone retirement home complex in Ermine Street, Buntingford in Hertfordshire on 11 August. Mr Neagu was remanded in custody ahead of a trial next February.